We are taking expressions of interest in our planned litter out of our imported Danish Weimaraner, Hunt 'N' Fun Dana of Bastillian (Dana) and our home bred Bastillian Haakon Maximus (Max). Dana is out of renowned Danish working lines established by Karin Hoey's Hot Shoot's kennel. Her pedigree includes proven hunting and trialling dogs, principally from Denmark, Sweden, France & Germany. 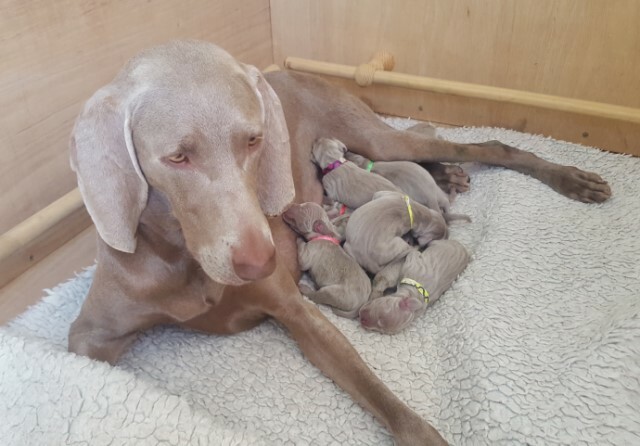 Dana is an out and out hunting weimaraner and was specially selected for these attributes which we believe will greatly enhance the working side of the breed in the UK. 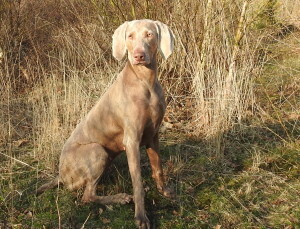 Max is our home bred working and trialling-hunting weimaraner. He works avidly to the gun and simply loves retrieving from water. The litter has been planned for many years. Please feel free to contact me if you would like to be considered as a potential owner of a puppy from this litter. These puppies are expected to retain a very strong hunting drive so the choice of what a suitable home will be might disappoint some enquirers. However, any litter will contain pups with varying aptitudes, so I will endeavour to place the right pup in the right home. Docked and dewed, this litter's KC registration will be endorsed R and X, so a restriction on breeding will be registered, and no export. The R can be lifted subject to satisfactory health tests. Please email me to register your interest. I breed only occasionally, when a puppy is desired for myself, and/or when there are genuine enquiries for puppies. In any event I breed with a primary focus on promoting the working characteristics of the breed. To this end great care is taken with the choice of sire to do the utmost to help preserve and enhance the natural aptitude of the progeny for working. This duality of proven conformance to the breed standard by showing, and proven ability in the working sphere for both sire and dam, I believe, will help provide the the Bastillian puppy with the maximum advantage to receive training towards a successful career as a working gundog. The choice of the sire will also place reliance on show judges who have gone over the dog to appraise conformance with the breed standard.